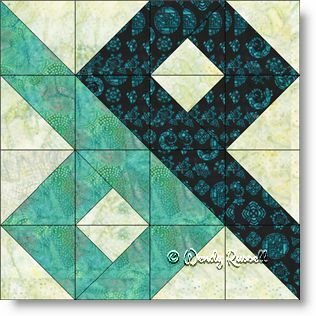 The Chinese Puzzle quilt block is comprised of half square triangles and a few quarter square triangles. The sample quilts illustrated both use rotations of the blocks by 90 degrees. The quilt on the right also reverses the placement of the focus fabrics to produce mirror image blocks and as a result, a very different quilt. Only your imagination can limit the design of your own quilt.